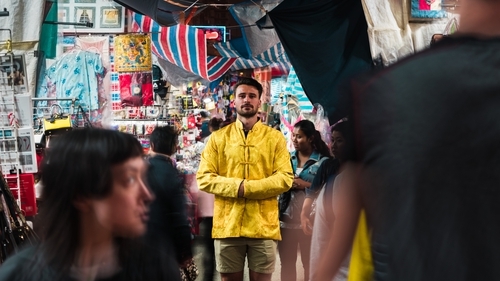 We caught up with Harry McNulty, asking him everything from how does he pack for a cruise journey around the world, to how he plans to deal with jet lag. You see the posts often, the ones that don't even seem real. "Stay at this temple and mind the cats for a year, for free." "This bookshop will pay you to read." "Travel the world on a cruise and post about it online." They're like computer-generated dream jobs, the kind you daydream about on the bus but know never actually happen. Except the last one can, and will, for one lucky Irishman. Royal Caribbean, the premier cruise company in the world, released an advertisement for an apprentice "Shore Explore", an on-board explorer and adventure by trade, who will get paid a salary of £104,000 (€118,000) to travel the world, chasing down the most exciting on-land activities for guests and post about it on social media. Harry McNulty, a professional rugby player and self-taught ‘Insta-traveller’ from Dublin, beat out 37,000 UK and Irish candidates to travel the world with the cruise company, visiting Japan, Alaska, Europe and the Middle East and immersing himself in these cultures. On top of that, he will be one of the first to step foot on an exclusive private island in the Caribbean, Perfect Day at CocoCay, opening next month. We caught up with the man who proves that dream jobs can come true, to hear all about how he nabbed the job of a lifetime. How did you start blogging about travel on Instagram? I moved to Brisbane in 2015 through the study abroad programme at UCD and this really inspired my passion for documenting my travels. I did solo trips to the Whitsunday islands, Bali and along the east coast of Australia. I brought my GoPro with me and documented all of my adventures. I loved it so much that I’ve decided to continue to document my travels ever since! Have you always been an avid traveller? If so, what has your favourite place to visit been? My whole life I’ve loved to travel and see new cultures. I was very lucky growing up that my parents brought us on family holidays all over the world, from Jamaica to Sri Lanka and South Africa. My mom was also an air hostess for the King of Bahrain before she met my Dad, so the travel bug is definitely in the family! My favourite destination so far has to be Fiji. I travelled there last summer with one of my best friends from New York and we had the trip of a lifetime. Three weeks travelling through different islands and living with locals when we had a chance, I even made the National Newspaper on that trip. You travel enough as it is with the rugby team, what drew you to this opportunity? I’m very lucky that I’m able to travel so much and see so many different places, but travelling with work means the ability to switch off can be difficult. When on a holiday having "me" time is so important. The ability to do what you want, when and not have any worries about anything else doesn’t come by often so it’s important to enjoy it. I was immediately intrigued and excited when I saw the launch of the competition. I think it's an exciting and fun brand and I saw this competition as a brilliant opportunity to travel the world and not have to worry about anything else except for what that country has to offer, as well as documenting my experiences. Your video caught the judges’ eyes, what went into creating that in terms of making an "extraordinary" image that told a story, as the competition requested? The only rules to apply were tag @RoyalCaribbeanUK and use the hashtag #ShoreExplorer. I knew that my application had to be different and fun! They were looking for an adrenaline junkie who is not only hungry for adventure, but also has a unique ability to capture a moment and tell a story in a simple social media post. I wanted to make a video that would really stand out but was reflective of me and all that I love. It was great craic making the video - I wanted to make sure I spoke in one take to keep the sequence clean, so you can imagine how many takes there were. That’s where all the bloopers came from! After that, I was in my element and just used as much footage of my travels as I could. What are you most looking forward to? Is there anything you’re a bit nervous about? Japan is the location I am most looking forward to as I’ve had a fascination with that country since I was a child. One of my best friends from my childhood was Japanese and he moved back when we were young, so it’s always been on my mind. Japan is full of beautiful landscapes, incredible art, technology and stunning architecture, it really Is a different world. Having said that, I’m incredibly excited for all the destinations! I’m excited to document my experiences for other people to see, the only nerves I have are actually delivering content that I’m proud of. I have really high expectations for myself. Part of your job will be to scope out on-land activities for cruise guests, how do you plan to find as many good-quality experiences? Do you worry about navigating a country alone? I will only have a limited time in each place so time management will be huge! I plan to take the shore excursion programme to the next level, scoping out new, exciting experiences. I’ll definitely use the places section on Instagram to see what areas are popular in those destinations and then I’ll use google to check out local delicacies! I’m not worried about going alone. Last year I went to Turkey and Jordan alone and I had the best time ever. Going alone allows you to meet more people and also fully indulge in every experience, which is really important. Certain trips are better with friends, but I think this is the perfect solo journey! You’ll be zipping from Japan to the Middle East and even to Alaska, which is such a variety of locations! How do you pack for this kind of trip? I’ve been asking myself the same question! The trip will be during the summer time so most of the destinations will be pretty hot and easy to pack for. With Alaska and Norway, it will be a bit cooler. I’ll do some research into very light and warm clothes so that I can minimize packing space but ensure I’m good to go for any weather. Have you been on a cruise before? What pros and cons do you expect to come from a trip like this? I have never been on a cruise ship before, so I am really excited to get on board and experience the hospitality. I expect the service will be world class and there will be more to do onboard than I will have time for! I’m looking forward to a couple robot bar cocktails*, as well as a surf on the cruise ship's 40-foot-long surf simulator, FlowRider and bungee jump simulator SkyPad. I also cannot wait to experience Perfect Day℠ at CocoCay – I feel so lucky that I will be among the first to set foot on a private Caribbean island, complete with the tallest waterslide in North America. So far as cons go, I think I won’t have many! As an avid traveller, do you have any travel tips to share? I never travel without an extension lead. I have one with five plugs and two USB slots. This means I only ever need one rest of world adapter and I can use all of my own plugs from home. Essential when you have to charge lots of things at once! A portable charger is also really important especially if the trip you are going on is off the beaten track. You can get solar powered ones, so even if you are out of juice you can stick the battery in the sun with a phone and you’ll get a charge. I also need a really good neck pillow for flights, which helps me sleep and feel good on the other side. Finally, get to know the locals, they will always know something Google won't! How do you deal with the jet lag? Having a mindset of accepting I’ll be jetlagged, and I do what I need to help get over it, then I’m more at ease with it. When it comes to blogging about travel online, what is it we’re looking for: great photos, stories, authentic insight into the character of a place or something else entirely? Great photos are always going to be a bonus! But photographers are so good that they can make a lot of places look bigger or better than when you arrive, so always take them with a pinch a salt. For me, authentic insight is always best. Ask yourself what you want out of the trip and then weigh up the pros and cons. If the pros outweigh the cons, go and have an incredible time! What is it about travel that consumes people? What is your favourite thing about it? Travel allows people to discover new things, stimulating the mind, body, soul. You really can't beat the thrill of exploring new destinations and experiences, making new memories - whether on land or sea - and that's what becoming a Shore Explorer is all about. I really love to see how other cultures have developed and created so many amazing ways to live, I can always bring something home with me mentally or physically to add to my life and make it better. It’s a really nice feeling. On a few of your posts, you’ve highlighted the damage that climate change is doing to the environment, such as the reef in Fiji. How do we square our love for travel with the negative impact of that on the earth? We all have a role to play and we have to do it every day! Any change at home is always going to help, I try and minimise my plastic use whenever I can. I have a bamboo toothbrush on subscription and I carry around a reusable water bottle. I know that can be hard especially in countries with poor water quality, but it doesn’t hurt trying. Even just turning off the lights at home and making the effort to always recycle. Thankfully, a lot more people are trying to put their best foot forward and make a change. I’ve seen social media movements such as #trashtag and Adventure Bag, which try and highlight the problems with plastic in the world. Don’t be afraid to say to friends and family that they don’t need to use that straw or buy that bottle.